There’s nothing better than enthusiastic and eager fans reaching out to your brand on social. Always responding quickly and accurately to these messages is challenging but important, especially given that an average response time for a brand is 10 hours while the average user will only wait four hours. 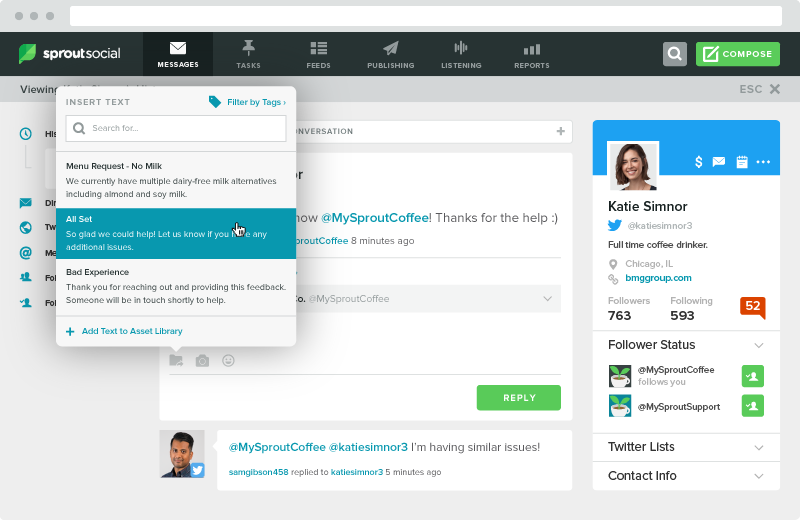 We’re excited to introduce Saved Replies, Sprout Social’s new tool to store and send custom responses. Gone are the days of endless copy/pasting and shared spreadsheets; now you can stay productive and ensure that your responses stay on-brand with a library of custom replies. 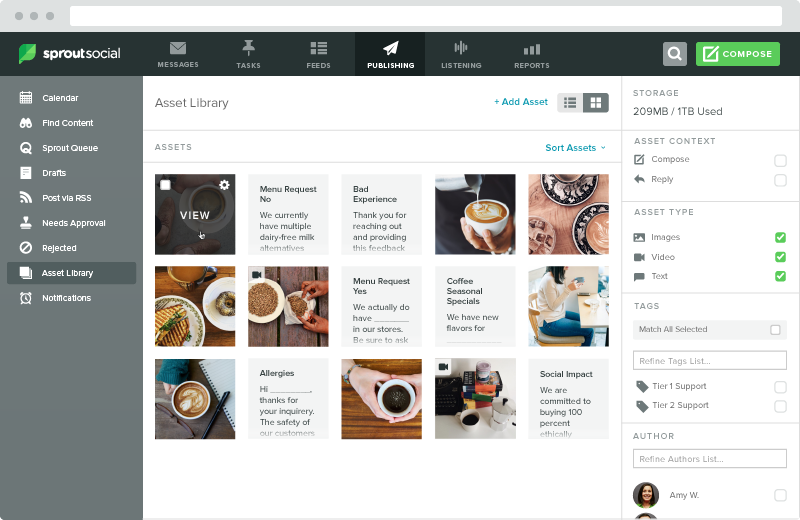 Saved Replies, available on the Advanced plan, are managed from Sprout’s Asset Library, where you can store and manage a new asset type: Text. Once you’ve configured your pre-saved text snippets, they can be inserted when replying or when creating a message through Compose. You can ensure your messaging is accurate by configuring permissions for who can view, create and edit your replies. To prevent your responses from sounding robotic, you can send your replies as-is or add an extra personalized touch by modifying your responses before they are sent. Of course, when building and maintaining a library of replies it’s important that you keep them organized to find them quickly. That’s why Saved Replies is tightly integrated with Sprout’s tagging system, allowing you to categorize your responses accordingly. Name your replies and search for them by title, giving you the organization you need to make your customer service faster and more productive. Do you find yourself sending similar responses or searching for answers to the same questions? The repetition is cumbersome and you know that your time could be better spent, especially if you’re a first responder. Now, keep all of your replies in one location and find them quickly. When you see a commonly asked question, a few clicks will insert your desired answer into your reply window. Because Save Replies are completely customizable, you can even use them to save common links or hashtags, making it easy for your team to access and insert them while responding. Saved Replies also pairs well with Sprout’s other time-saving reply tools such as automated chatbots and Twitter Suggested Replies, which uses machine-learning to determine your most frequently sent responses and surfaces them as a reply option. Social campaign planning shouldn’t feel disjointed from your social customer care. Even if different team members handle these tasks, your social handles are seen by audiences as one cohesive brand. To bring more continuity to these workflows, the text you store in the Asset Library can be used for your published content or your replies—or both! Plan your scheduled content while also storing answers to anticipated questions. For example, you may plan a social campaign where your responses will likely include where to redeem a coupon or links to find more information. Having a content library with Saved Replies lets you plan your outgoing messages while also storing replies to arm your customer care team with the answers to respond quickly and accurately. We can’t wait to hear how Saved Replies makes your team more efficient. Let us know in the comments below or on Twitter @SproutSocial.